Now it is time to spice up our «Hello World» application with some business code. With SeedStack business framework, it is easy to write clean and maintainable business code. But keep in mind that it’s up to you to provide a proper model for the business problems you’re solving. 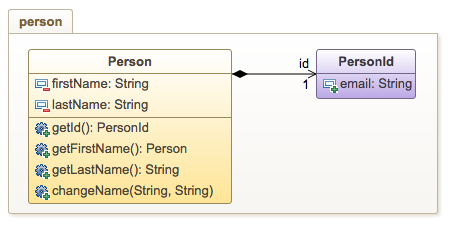 Read more about the Domain-Driven Design on the DDD basics page. We don’t want to go into the details of Domain-Driven Design yet, so we will use a trivial domain model with a single aggregate. The PersonId class is a value object that is used as an identifier. The Person class is an entity that act as the root of the person aggregate. A changeName() business-meaningful method is preferred over setters. A package materializes the boundary of the person aggregate. How to write a very simple service. If you want to learn more, continue on the tutorial to learn about persistence.